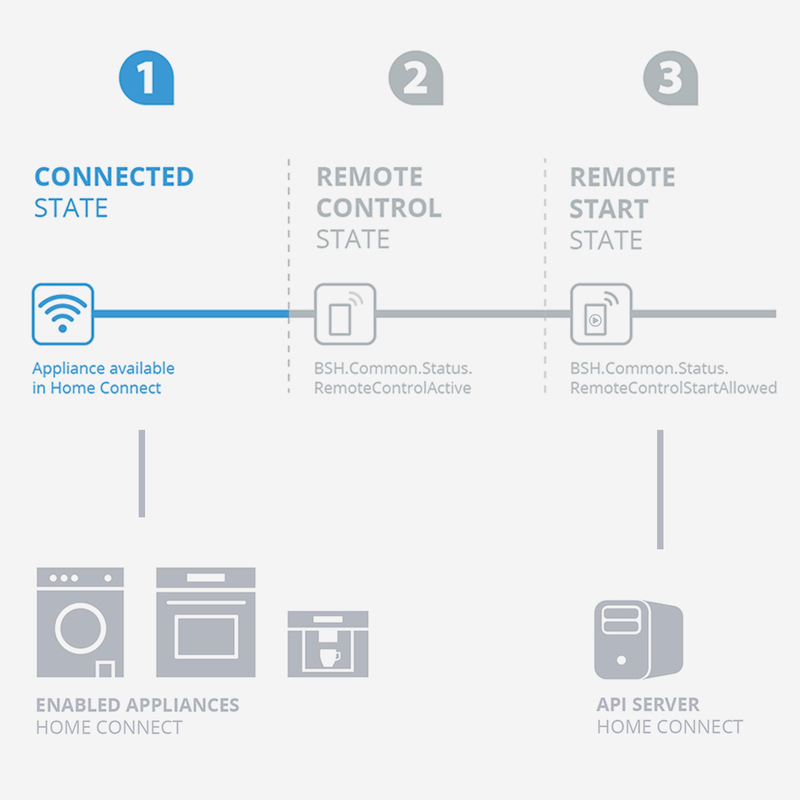 Home Connect enables remote access to home appliances of Bosch, Siemens, Gaggenau, Neff & Thermador. You can use Home Connect to start and stop programs, adjust settings, read status and monitor events. You are obliged to comply with our Developer Guidelines as stated in our Developer Agreement. The Developer Guidelines consists of four parts related to Security, Data Usage, Branding and Application. Please note that the Developer Guidelines, of course, cannot be exhaustive. By applying common sense of how a functional application should work you will in general comply with our Developer Guidelines. Please contact us in case you have any questions to our Developer Guidelines. A user has to be informed about any start or stop of a program. It is strongly encouraged to start or stop programs only by user triggers, e.g. the user pressing a button. All functions have to be used carefully and efficiently to solve the envisaged objectives. A high number of requests, i.e. multiple requests per minute per device, or invalid requests may be blocked. Please refer to the section Limitations for more details. Any information exchanged with the API must not be presented to the user with semantic changes. For instance, it is prohibited to show ‘Eco 50°C Program has been started’ instead of ‘Auto 65-75°C Program has been started’. Error messages like ‘Program cannot be started due to open door’ returned by the API have to be shown to the user. The user interface for the authentication/authorization of users has to be shown unmodified in a maximized web form/browser. It is not allowed to change or embed it. A user has to confirm any disclosure of any information gained or derived from the Home Connect system to 3rd parties. For instance, forwarding presence information detected by a user opening the oven door has to be explicitly confirmed by the user. Access and refresh tokens have to be stored in a secure way. Client Secret data has to be kept secret and are not be disclosed without the prior written agreement of Home Connect. Any data that is generated through the usage of our API is not allowed to be sold or provided to another party as well as to monetize the data generated by the API without the prior written agreement of Home Connect GmbH. Home Connect is not the owner of the trademarks “Bosch” and “Siemens” and is also not entitled to grant you a license to use these trademarks. You may state that your application is compatible with Home Connect enabled home appliances, if this is technically correct. Please note that you may not use any Home Connect branding in the app icon, app, service or any other graphics without our written consent. To implement the best working solution please check our best practices section. Especially take note of how to monitor program progress. Please use the event channel if you need to react to any state change. Polling for state changes shall be limited to a minimum. Once you have completed testing, you have the opportunity to share your work with the world! When you create your developer account, we'll ask you basic questions about yourself and your company. Once you have finished testing your application, you can submit a request to publish your application. We will review your request before approving it for release to Home Connect users, based on the above guidelines. After you've submitted your publication request, you won't be able to make any changes, so make sure to double check your work before doing so! 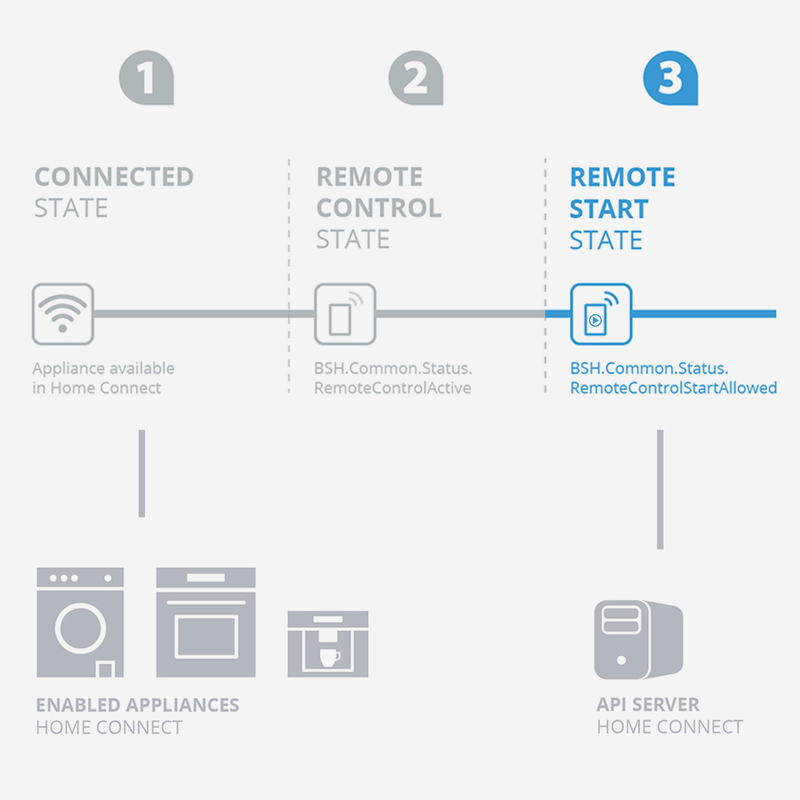 Remote access via Home Connect is provided by the Home Connect API. Direct access to home appliances is not possible. The following graphic shows a high-level overview of the connections between the technical components. The individual items are explained in the text below the graphic. The Home Connect API is the control center for exchanging requests with the physical home appliance. Home Connect enabled appliances can only be addressed via the API; a direct connection to the appliance is not possible. While the API Server is used to access the physical appliances, the API Simulator is connected to the simulated appliances on the Home Connect Developer Portal. As a developer you can choose to either test your applications with a physical or a simulated appliance. Access the home appliance simulators here. You need to be logged into your account to access the simulators. The physical Home Connect enabled appliances are connected to the Home Connect API server. Currently the following home appliance categories are supported: oven, dishwasher, coffee machine, fridge/freezer, washer and dryer. Further categories will follow in the future. 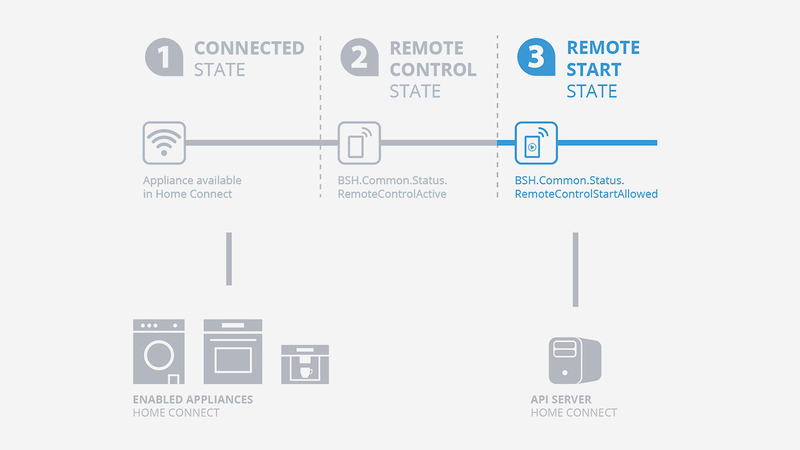 3rd party applications can be integrated by connecting the Home Connect API server (or Simulator) to a 3rd party environment. 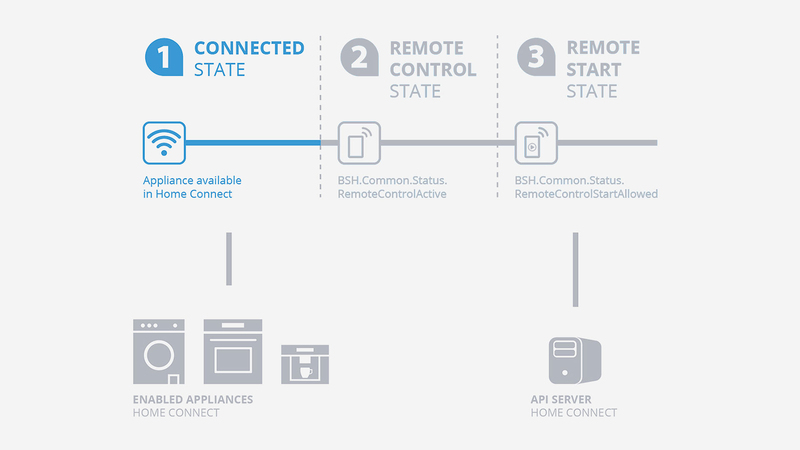 Smart Home solutions, other 3rd party services or inter-server communication can be integrated by connecting the Home Connect API server (or Simulator) to a 3rd party environment. 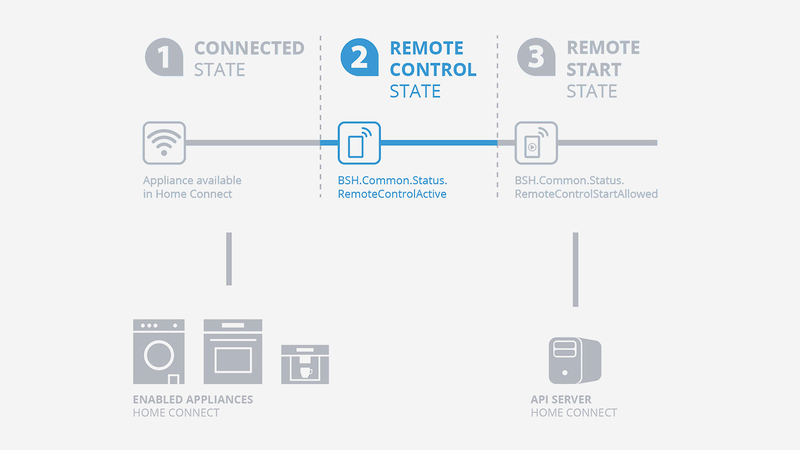 Develop server based or direct machine to machine communication by integrating the Home Connect API documentation to a 3rd party server environment. Test your implementation using the Home Connect home appliance simulators in the developer portal. Those are accessible using the Home Connect API Simulator. After registration, just click the link in the header navigation and select an appliance you'd like to simulate. Access the home appliance simulators here. You need to be logged into your account to access the simulators. 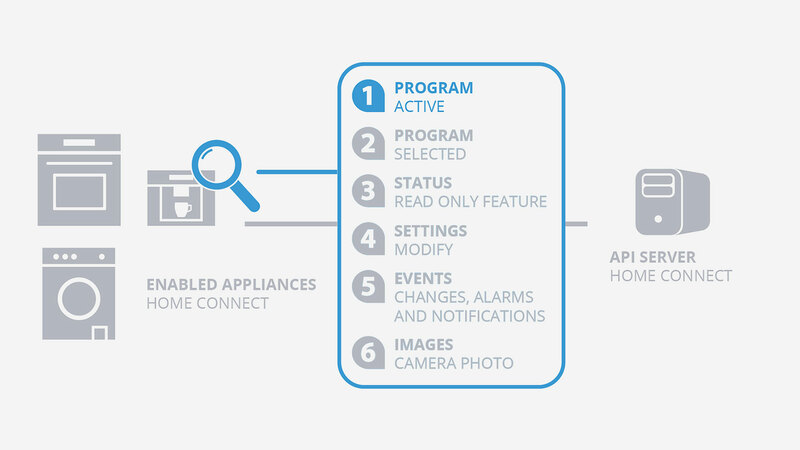 Via Home Connect the following features are accessible: Programs, Status, Settings, Events & Images. The available programs differ depending on the appliance. It is currently being executed. It is merely displayed on the user interface of the home appliance. Programs can be configured by options like duration or temperature. The respective options differ on ovens, dishwashers, etc. Feature of a home appliance which is read-only, e.g. state of the door (open or closed) of the oven. 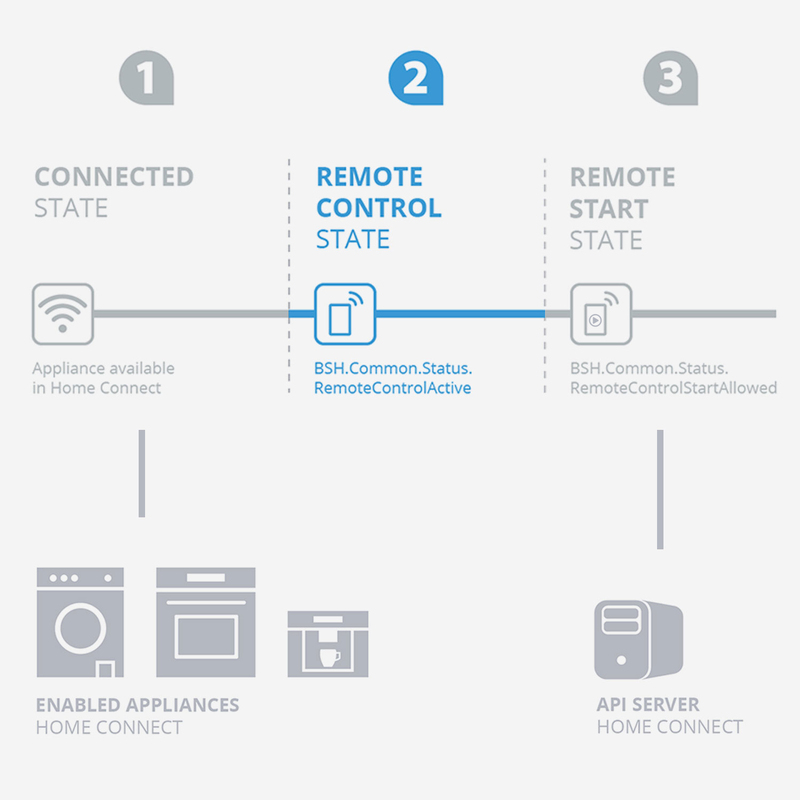 A Home Connect enabled appliance can have different possible states, which reflect how they can be remote controlled. 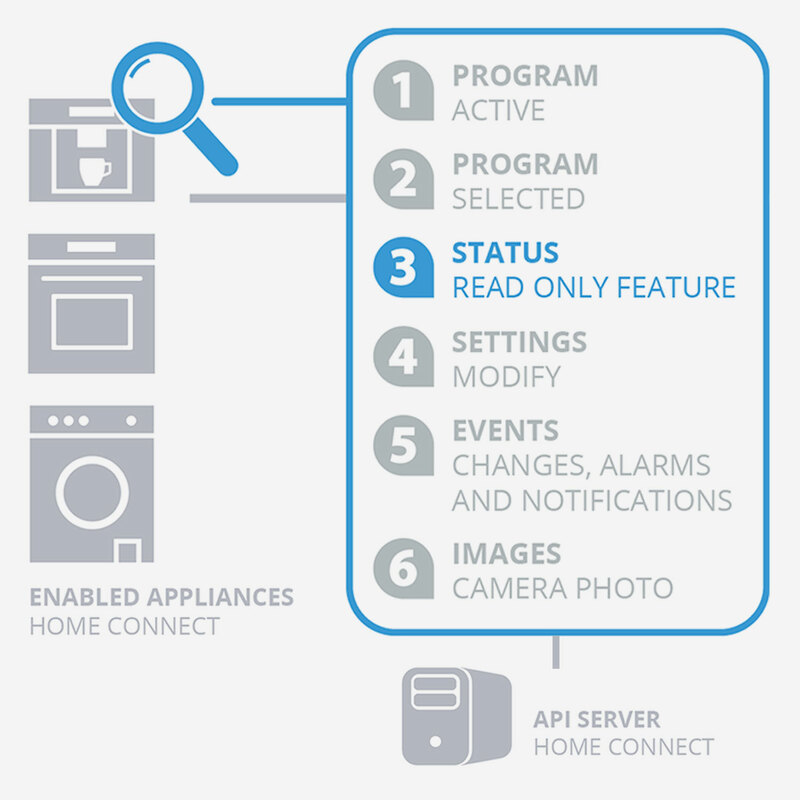 Status reflects if the home appliance is connected to Wifi, registered in Home Connect and paired with the user account. Means that the appliance is reachable online. This status reflects if a configuration on ovens, dishwashers, washers and dryers is set, which is required to connect to the home appliance remotely. This status reflects if a configuration on ovens, dishwashers, washers, dryers and coffee makers is set, which is required to start programs remotely on the home appliance. Means that the remote control for this appliance is allowed. 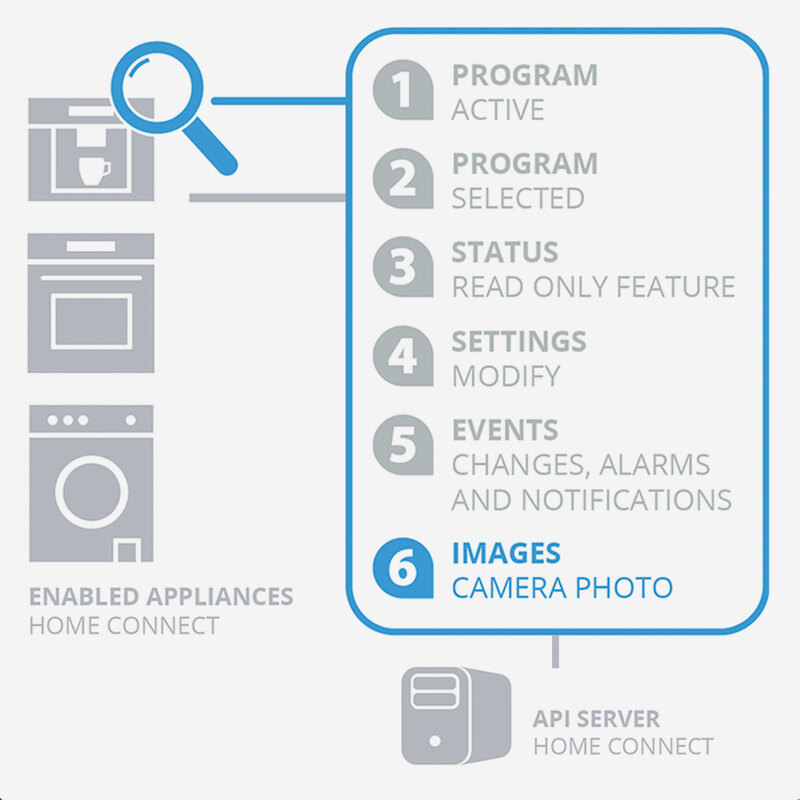 This configuration may be reset by the home appliance if the user takes over again, e.g. opens the door or controls the home appliance locally.